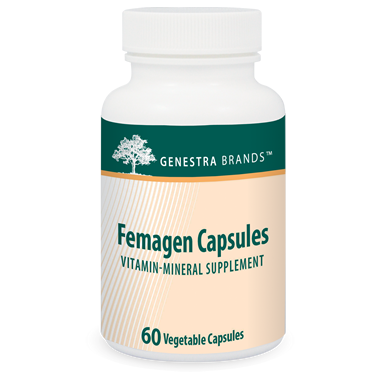 Genestra Femagen PMS Capsules contain a blend of vitamins, minerals and herbs that help relieve symptoms associated with premenstrual syndrome (PMS). Approximately 30-80% of women experience mild to moderate PMS symptoms each month. PMS symptoms may result from elevated levels of estrogen or decreased levels of vitamins and minerals. Chasteberry improves hormonal balance by increasing the release of luteinizing hormone, which stimulates progesterone release and ultimately decreases estrogen secretion. Beta-carotene is a provitamin A carotenoid pigment naturally found in plants. B vitamins help mediate hundreds of enzymatic reactions, including the metabolism of carbohydrates, fats and proteins. Niacin and thiamine help to provide substrates for energy production in the Krebs cycle, while vitamin B and folate are involved in the formation of red blood cells through their role in DNA synthesis.